I read a few threads that mentioned the POV getting old and leaking. Did not want that happening but still wanted a safety just in case something when wrong, so made my own. 1" stainless steel pipe thread plug with a 1/4" threaded adapter hole. I found a company that makes pressure relief valves and ordered one for 15 psi. Ahhh, the good ol FC Kingston valve. Be sure to pressure test that in a few years. The springs wear out pretty quickly so it'll open at decreasing pressure over time. I like this solution though. I never took the POV off of my cars because of the fears you listed. Any change in perceived power levels? Thanks for the heads up. I will check it in a few years. Even if I had to replace it every couple of years, not a big deal. They are cheap enough and I just like having that extra safety. I did not see any change in power level, I don't think my old one was bad. I still need to get a good boost gauge to see what pressure I am running at. I can't tell from the stock one. That is next to buy on the shopping list, I am looking at the Greddy boost controller. I like the gauge and being able to dial the boost from inside the car. The downside is the price. They are not cheap. I'm gonna be following that closely should you decide to document the install. I'm in dire need of a real boost gauge and wideband on the SR but I'm too stupid/afraid to figure out how to wire those in. I just did the wide band install on the car. I will create a write up on how I did it. Maybe it will help the next guys or give him ideas. I will also do one for the boost gauge but it might be a while before I buy that one. I still need to get the latest issue fixed. I have my hesitation back but now I know it is running way too lean when I loose power. I just need to find some time to mess with it again. Check all my connections and make sure it was not my wide band install that has caused the issue. I am using the narrow band output from the wide band to go to the computer. So using one O2 sensor for both the wide band gauge and the car computer. I'll definitely be pouring over any write up you present. Wiring just doesn't register in my brain for some reason. Not enough tangibility, I'd wager. I seem to recall that the sensor for the wide band and for the car ECU is quite different. I have the OEM in the standard downpipe location and the AFR sensor further down. Just had the shop that built my exhaust weld in a bung for that. Mounted the Boost Gauge and AFR on the driver pillar using a Miata gauge mount, came out beautiful. It puts the gauges in my view so I can control the boost easier. Yes they are. The car uses a narrow band sensor. The narrow band tells the car if its rich, stoic or lean. You only have 3 reading. The wide band knows the exact ratio of air to fuel. So the controller box outputs the 3 readings that the stock computer needs as if the sensor was a narrow band sensor. Sounds good to me, I hope you solve the hesitation issue soon. I know mine has some issues at high boost, above about 10-12 psi. I need to replace some ignition components and reduce the spark plug gap. I think I may have installed them at normal gap and at high boost they misfire. My engine goes real rich at boost, going to 10 or less on the AFR. At least I won't have detonation issues with that. I think I solved my hesitation/lean issue. Over the weekend I pulled all the connectors on the engine harness. Some of them were corroded green going to the fuel injectors and others were nice and clean. I still shot all of them with the contact cleaner spray and re-assembled all together. Not positive because I pulled all the connectors but I think my issue with going lean was due to the fact that 3 of the 4 intake plugs were loose. This is the third time I have tightened them down. 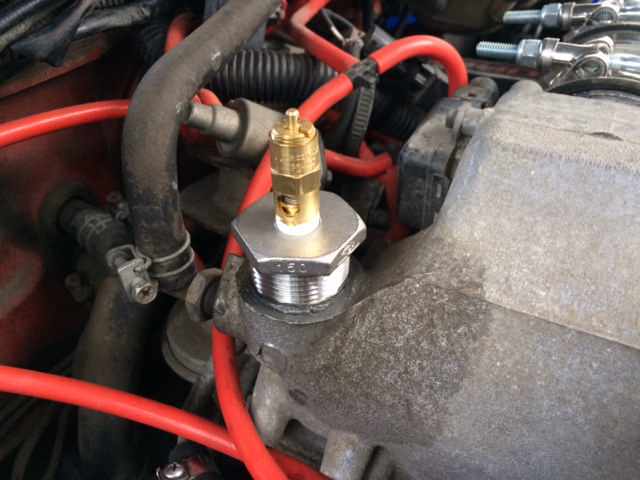 I did not crank on them when I installed the new plugs because of the aluminum heads, but did have them nice and tight. I wonder if the previous owner did not put the plugs in correctly and a carbon ring formed on the threads making the plug feel like it was tight. Now because I am running it, the carbon is being dissolved and the plugs loosen up. Only a guess but the car runs good again. I also made some new MSD plug wires using their V8 universal kit. Now I just need to create a bracket to mount the two MSD coils. That is next on the list. It is better to run rich under boost than lean. Under boost I see about 10.8 but that is on stock PSI. What plugs are you running? If you are not running them yet try the Iridium plugs. Expensive but I think they are worth it. I am running the NGK plugs, one heat range cooler as suggested long ago. Might go with iridium when I get around to pulling the engine for some PM. I replaced the fuel pressure regulator with a Nismo one years back and I think it may be a bit aggressive. I just don't go WOT on mine, still gets out in traffic MUCH better than it used to. Put in a T25 with fmic setup, well worth the effort! Can you take a picture of your Miata gauge mount? I would like to see how it fits. Also what year Miata is it for? Cajun, thanks for the pics. I just wanted to see how that looks because our A pillar trim has a weird profile. I looks pretty good, just a little gap on the backside. Looks great on the pic and the fmic setup looks awesome as well. I'm probably going to copy that. If I recall correctly, the pillar mount is for early 90's Miata, but I did get the idea from a thread on this forum. It fit with only the slightest trimming. I like you pop off valve , good idea but, the pressure relief valve you chose is for a air compressor tank and won't flow enough to limmit your engine from over boosting, good idea though and it's defiantly better than just caping it off, greedy used to make a adjustable pop off valve for our cars, sometime you can find a used one on ebay. I know it is for an air compressor. This is just a safety, just in case something goes wrong. It might night flow enough to keep up with the turbo boosting at full but should be enough to give you time to notice that your are over boosting and shut it down before stuff blows up. Thanks for the link and that price is not too bad. The Greddy ones I seen were in the $300 range.